The Next Stage: Women and Retirement: Return to Rome: The 2016 Italy diaries, Part I. We postponed an October vacation because of the election; I was afraid of being glued to CNN, NYT and not focusing on Rome and Naples. 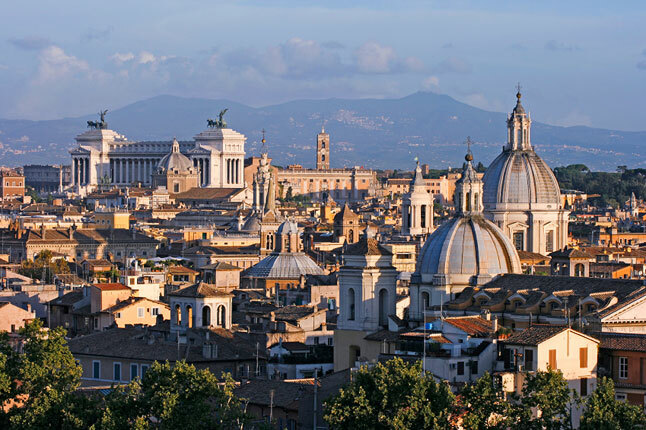 So we made reservations to fly to Rome on November 9th. We thought we would be celebrating Hillary’s victory. I was in a state of shock on November 9th, thankful that we would have Italy to take our minds off the disastrous election results. This was our 6th trip to Rome and probably our last. Rome was more beautiful than ever. We always stay in small hotels—there is usually better service and we’re more likely to get a sense of the city. Now that we are seventy-something travellers we need to stay in more comfortable hotels than when we started traveling together almost 40 years ago. Also, since we didn’t want to spend a lot of time just getting around, we wanted a central location. We settled on The Inn at the Spanish Steps -—charming, but more expensive than we’d like. However, our traveling years are winding down, so it seems like this is the time to splurge. The staff was terrific, the breakfasts were wonderful and served on a lovely roof-top terrace. The hotel was on a side street off the Piazza di Spagna and therefore in a busy part of Rome--but it’s not so easy getting an affordable, comfortable, centrally located hotel in a quiet part of Rome. We found ourselves doing what we had done in Paris when we returned after a long absence—we revisited the places we really loved. Our hotel was in walking distance from the Piazza del Popolo so that was the first place we headed to see the twin churches I love so much. As always happens in Italy, something you really want to see—this time one of the twin churches-- was closed for restoration. What I love so much about Rome is the sense of history everywhere: ancient Egyptian obelisks, Trajan’s column, the Colosseum, the Baths of Caracolla--all right there in central Rome. We did a lot of wandering around taking in the open-air architectural museum. 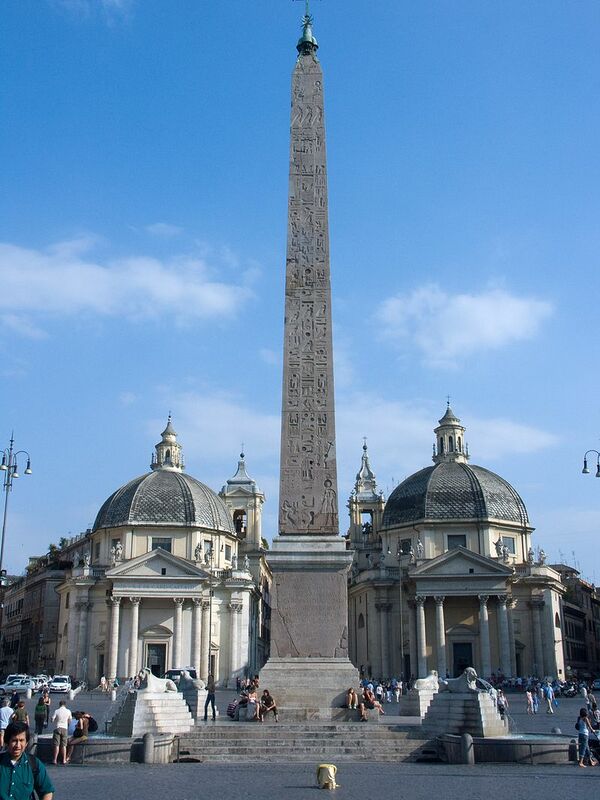 I wanted to see the Vatican museums one more time. Rick didn’t think he could take the crowds, but I thought that maybe in November the crowds would not be so bad. I was wrong. There’s no such thing as off-season where the Vatican is concerned. 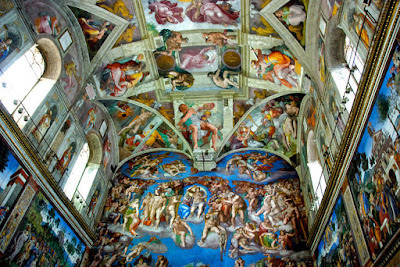 But it was worth braving the crowds to see the Sistine Chapel one more time. The last time was right after the restoration of the Michelangelo ceiling frescoes and the subdued grays and browns were in bright, jewel like colors. They struck me as garish and I preferred the old unrestored frescoes. Now the colors have dimmed somewhat and no longer look so garish, but maybe I’ve just gotten used to Michelangelo in technicolor. 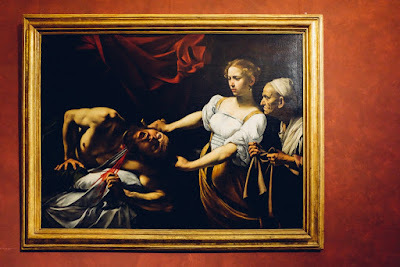 We also went to the Barberini Palace which is not a “must see” on the tour bus circuit, so was delightfully uncrowded. It has two paintings which alone are worth a visit. 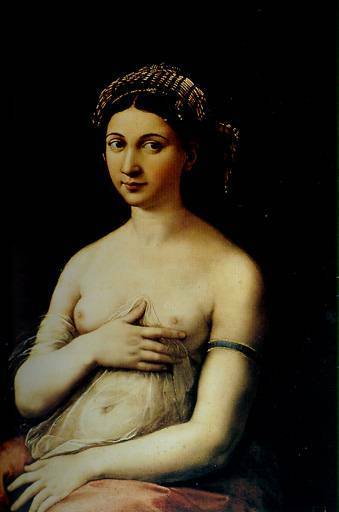 Raphael’s La Fornarina, a portrait of the love of his life, who worked in a bakery in Trastevere and Caravaggio’s Judith Beheading Holophernes. 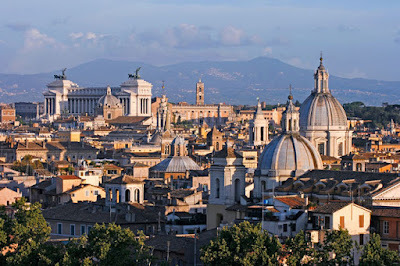 If I were a young person, I would figure out some way to spend a year in Rome! Oh, this makes me so very happy!